There’s a “recycling revolution” happening in Sweden – one that has pushed the country closer to zero waste than ever before. In fact, less than one per cent of Sweden’s household garbage ends up in landfills today. Topographic change due to landfill operations has been observed based on some of the features delineated by the elevation differencing and thresholding process. The resulting altered landforms from landfills differ from other anthropogenic activities in that much of the deposited material is not rock and soil that had been previously excavated but man-made material that has been transported to the deposition site. The figure below shows the Sunshine Canyon landfill in Sylmar, California, an example of topographic change due to landfill operations. The operation and expansion of this landfill continues to be a controversial topic in the local area. The close proximity of the landfill site to a major transportation artery is a reminder that visual impacts of human geomorphic activities can be significant. Topographic surface change resulting from landfill operation (Sunshine Canyon landfill in Sylmar, California). 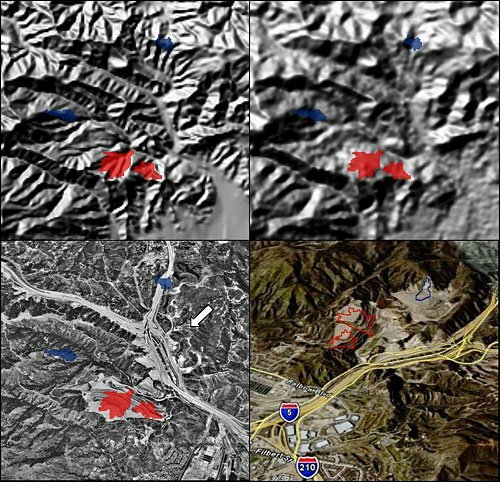 The images are NED shaded relief (upper left), SRTM shaded relief (upper right), aerial photograph (lower left), and perspective view (lower right). Change polygons (blue = cut; red = fill) have been overlaid on each image. The arrow indicates the view direction (toward the southwest) for the perspective view.